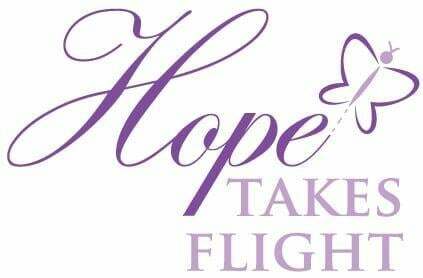 Do you know someone who should be honored with the 2019 Hope Takes Flight Award? Submit your nomination today! The Hope Takes Flight Award celebrates those unsung heroes in our community who, through their donation of time or money, improve the quality of life for those battling cancer as well as their caregivers. This award will be awarded annually to an individual or business who has made an impact in Washington County. The 2018 Hope Takes Flight Award celebrates the support and hope that Garnet Stevens has provided throughout the tri-state area. Garnet's sharing of his cancer journey on the radio, on his blog, and through his participation in many Relay For Life events has continually provided hope for so many who have been diagnosed with cancer. 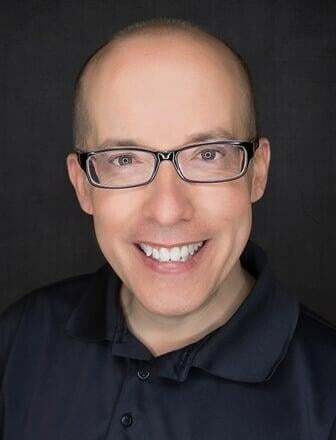 His ability to share his story in a frank, and sometimes comedic, way allow others who are battling cancer to know that they are not alone in their journey and that there are so many individuals throughout the community who are there to support them. For these and so many other reasons, we honor Garnet Stevens with the inaugural Hope Takes Flight Award. 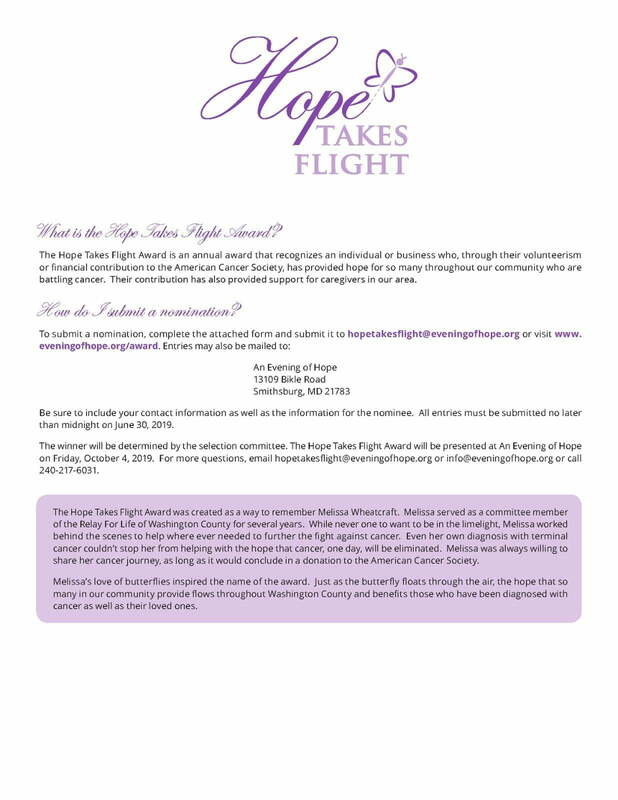 The Hope Takes Flight Award was created as a way to remember Melissa Wheatcraft. 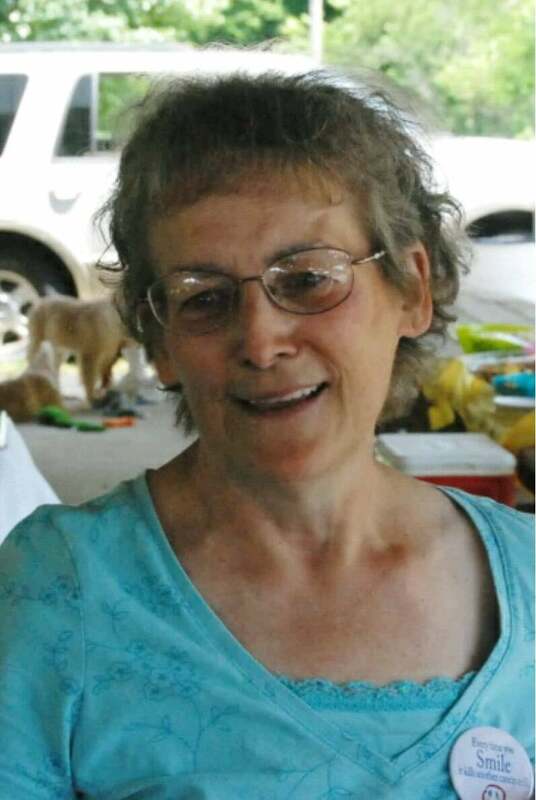 Melissa served as a committee member of the Relay For Life of Washington County for several years. While never one to want to be in the limelight, Melissa worked behind the scenes to help where ever needed to further the fight against cancer. Even her own diagnosis with terminal cancer couldn't stop her from helping with the hope that cancer, one day, will be eliminated. Melissa was always willing to share her cancer journey, as long as it would conclude in a donation to the American Cancer Society. Melissa's love of butterflies inspired the name of the award. Just as the butterfly floats through the air, the hope that so many in our community provide flows throughout Washington County and benefits those who have been diagnosed with cancer as well as their loved ones. or download the PDF above. 2018 An Evening of Hope. For questions or additional information, contact us at info@eveningofhope.org.